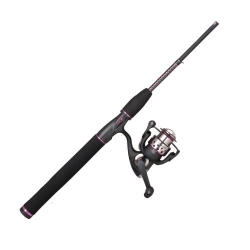 first Shakespeare reel designed specifically for Ugly Stik. yet sensitive rod with better balance. Ugly Stik GX2 Rods showcase a sleek matte black finish highlighted by pink and silver accents giving the rod a more modern look. These rods also feature the Ugly Stik logo etched into the EVA grip to give it a look all its own.